This year we are having a special offer for everybody who wants to give something not only special but also incredibly delicious for Christmas. On reservation we can wrap for you Christmas Gift Packs with the best of Le Marche Region food and wine. Just pop by or give us a call to order your pack and we will have it ready for you to be collected on the date you choose. Kitchen Porter/Cleaner wanted to start ASAP! We are looking for a FULL TIME KITCHEN PORTER and CLEANER to start ASAP. washing and disinfecting the whole bathroom including floor and walls. If you think you can match the description above please send your CV and Cover Letter to info@rossodisera.co.uk quoting KITCHEN PORTER VACANCY as object. Please note that due to the high volume of applications we are unable to offer individual feedback. If you don't hear from us within two weeks from your application please assume you haven't been successful. We are looking for an experienced waiter or waitress to join our team!! Kitchen Porter wanted to start ASAP! We are looking for a PART TIME KITCHEN PORTER to start ASAP until mid January. 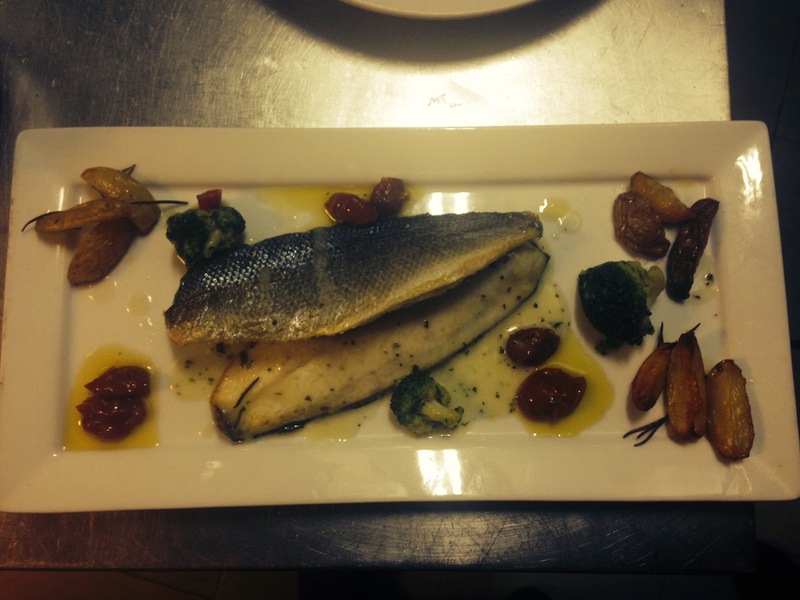 As all our customers know, we at Rossodisera have always been passionate about great artisan food prepared to the very best standards and to promote the typical Le Marche traditional cuisine in London is the core of our business. We personally source all the products we import from Le Marche and make a big effort in choosing only small artisan producers to offer you the very best delicacies from our region of Italy. We are now very pleased to offer you a dedicated Christmas Team Menu for your business parties with a choice among three different kinds off menu and any of them includes starter, pasta, a main course and the dessert of course! The Meat Menu includes our very well known Chitarrine Sibilla and Antipasto Misto, together with Coniglio in Porchetta and Millefoglie. The Seafood Menu starts with Panzanella & Prawns, followed by Tagliatelle al Sugo di Pesce, then the main Filetto di Spigola and the Millefoglie. The third option is the Vegetarian Menu starting with Crema di Patate con Uova di Quaglia e Tartufo and the Chitarrine Aglio, Olio, Peperoncino e Cicoria, followed by the main Frecantò and then the dessert. Please consult our website for any additional information Prices are per person and they don't include drinks. Tutti i nostri clienti sanno che al Rossodisera abbiamo sempre avuto una grande passione per un mangiare di qualità e preparato secondo standard ricercati e che la promozione della cucina tipica regionale Marchigiana è alla base del nostro lavoro. Ricerchiamo personalmente tutti i prodotti che importiamo dalle Marche e mettiamo grande attenzione nello scegliere prevalentemente piccoli produttori artigianali per offrirvi il meglio della cucina tipica della nostra regione d'Italia. Siamo ora molto lieti di offrirvi un menu specifico per Pranzi Aziendali con una scelta tra tre diverse tipologie di menù le quali includono tutte un antipasti, un primo, un secondo ed ovviamente il dolce! Il Menù di Carne include le nostre famose Chitarrine Sibilla e l'Antipasto Misto insieme con il Coniglio in Porchetta come secondo e la Millefoglie. Il Menù di Pesce inizia con una Panzanella con Gamberi seguita da Tagliatelle al Sugo di Pesce, Spigola al Forno e la Millefoglie. 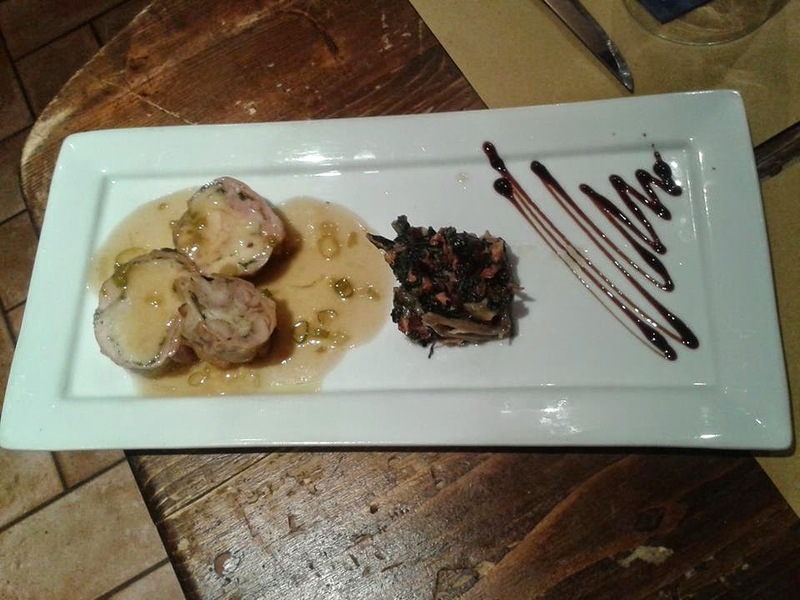 La terza opzione è un Menu Vegetariano con un antipasto di Crema di Patate,Uova di Quaglia e Tartufo, come primo le Chitarrine Aglio, Olio Peperoncino e Cicorie seguite dal Frecantò ed ovviamente il dolce. Consultate il nostro sito web per maggiori informazioni. I prezzi sono a persona bevande escluse. 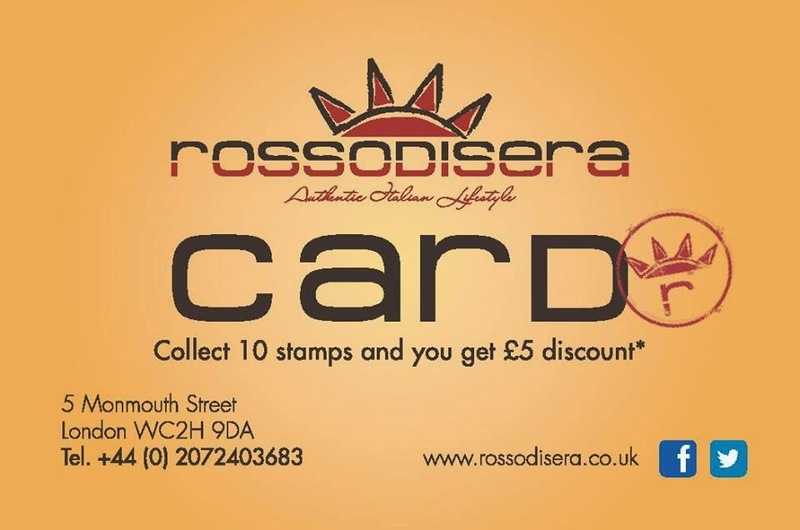 We are very proud to have again this Autumn until April 2015 the new Rossodisera Card for all our loyal customers. Even this year you will get a stamp any £10 pounds spent from Sunday to Wednesday and once you get 10 stamps you will be entitle to £5 discount to spend on our main menu any day of the week. T&C apply. Siamo molto lieti di avere di nuovo la Rossodisera Card per tutti i nostri affezionati clienti. Anche quest'anno riceverete un timbrino ogni 10 sterline di spesa nei giorni da Domenica a Mercoledì. Una volta che avrete completato la card con 10 timbrini riceverete uno sconto di 5 sterline da spendere ogni giorno della settimana sul nostro Main Menu.